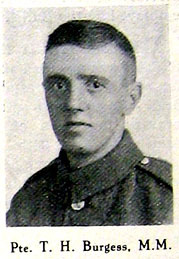 Private Thomas Henry BURGESS, MM. Private Thomas Henry BURGESS, MM. 19661. 6th Battalion Yorkshire Regiment, transferred to (29978) the East Yorkshire Regiment in March 1918. From the Medals Rolls Index Cards he first served with the Yorkshire Regiment at Gallipoli (December 1915). He was awarded the MM for delivering several urgent messages to the front line companies in a most gallant manner, whilst under extremely heavy fire. (but no mention in records of when this happened). "Jim" of the North East War Memorials Project (<jampas@btopenworld.com>) has kindly forwarded the attached photo, which comes from a contemporary in-house magazine of the Smith's Dock Company.